Find all your favorite Greek flavors in this fresh and easy Mediterranean Chopped Salad. It's great for lunch or makes a stellar summer side dish! In a small bowl, whisk together olive oil, vinegar, garlic, oregano, and 1/2 teaspoon salt. 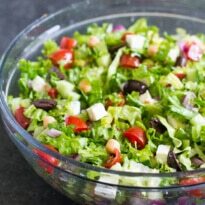 In a large bowl, combine lettuce, tomatoes, cucumbers, chickpeas, olives, red onion, and feta cheese. Drizzle with vinaigrette and toss to combine. Season to taste with salt and pepper. In place of the Persian cucumbers, you may substitute 2 Japanese cucumbers, 1 hot house cucumber, or one regular cucumber. If using a regular cucumber, peel, halve lengthwise, and remove seeds before chopping. Inspired by (but no longer closely resembling) the Mediterranean Chopped Salad in America's Test Kitchen Healthy Family Cookbook.